25 Allen & Heath Xone 43 packages available. Allen and Heath’s Xone:43 is a 4 channel analogue DJ mixer offering the very best of analogue audio quality, a reputation the brand has solidified over their years production. The Allen & Heath Xone 43 has several exciting features to offer including the legendary analogue Voltage Control Filter (VCF) system. Not only does it offer LPF, BPF and HPF modes, but also individual controls for ‘mild to wild’ resonance control and frequency to allow smooth filter sweeps. This allows maximum flexibility and originality in your mixes. If that wasn’t enough, to allow further creativity, the XFX can be routed to the zone filter with layers of effects and filtering. These fresh features allow you to create high-quality one-of-a-kind beats. In addition to the 4 phono/line input channels to the rear of the mixer, Allen and Heath’s Xone 43 features a flexible mic / aux input with XLR and phono connectors and 2-band EQ for tonal balance. The versatility of the mixer is increased by the integration of External effects loops via send and return connections. The replaceable crossfader has three switchable curve settings. For those who enjoy blending or scratching, these features can help you experiment and enhance your scratch performance. It can even be easily replaced or upgraded to the custom Innofader for a premium crossfader performance. 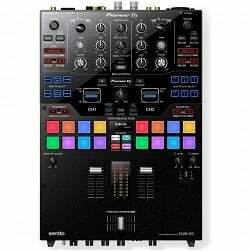 DJkit believes the Allen & Heath Xone 43 is perfect as the centerpiece of club booths or high end personal DJ set ups. It is also a tour ready mixer with robust build quality making it travel proof. Considering purchasing the Allen & Heath Xone 43? Have questions? Ask people who've recently bought one. Seen a video for Allen & Heath Xone 43 online or have you own video? Check out Allen & Heath Xone 43 on DJkit.com!